“Headlight,” now named Jack, was lying in the middle of the road, too weak and depressed to move out of the way of the car coming around the bend. Thankfully, the woman in the car saw Jack and stopped. 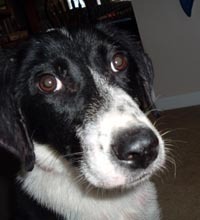 The little 9 month old border collie mix was scrawny from malnourishment and was full of mange. Jack was brought to Holly’s Place and was taken to the vet immediately. We did not have foster space for him, and because it was the 4th of July weekend, our vet was booked solid and had no place to board him. Thankfully Gail Covington was in the lobby of the vet clinic and overheard us discussing the problem. She immediately offered to foster Jack! Jack is now gaining weight and is being treated for his skin condition. He improves daily, and seems extremely grateful to his foster family. He bonds quickly with humans and is learning to be a puppy again. He will be ready for adoption within a few weeks.